In conjunction with this publication, the children’s art book Lafaek has a Party/Lafaek Halo Festa is available as a downloadable pdf in both Tetun and English. English: Lafaek has a Party by Ros Dunlop, Illustrated by Tony Amaral & Pelle Pereira. Tetun: Lafaek Halo Festa Hakerek husi Ros Dunlop, Ilustrasaun Tony Amaral no Pelle Pereira. The book is wonderful and everyone love it. I am playing the music the sound in my car. Loving it. The book is so genuine, like the music inside, ‘genuine, innocence and spontaneous’. A friend – who is not a musician and didn’t know about Timor before she opened the book – she’s a Doctor of Medicine. This is magnificent. Congratulations – I can’t wait to buy a copy for me, and other copies so that I can give them to friends. It is a glorious book that guides you through culture, music, history.It is a work of art as well as text and music. It is fantastic. Tricia Johns – Volunteer who has worked in Timor for many years. Congratulations this book is SUPERB. Beautiful colour photos and paintings with text that makes it easy for a layperson like me to read and enjoy. 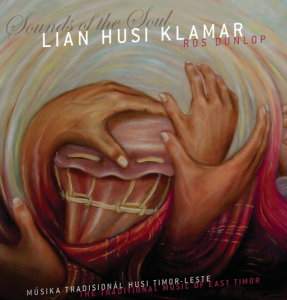 Timorese music, instruments, art, culture and traditions all in here displaying a passion and understanding of the country, her people and music. Definitely will be giving this as a Christmas gift to many friends. Thank you for this book, making sure Timor did not lose all this rich history and information. CONGRATULATIONS… the books look really wonderful! As the young people say now Ros, OMG!!!!!! That is overwhelmingly awesome. This book – the thoroughness and detail and the illustrations are superb!